I have lots to write about UKOUG2011 but I need to comment on Cary Millsap's keynote on Monday Evening. 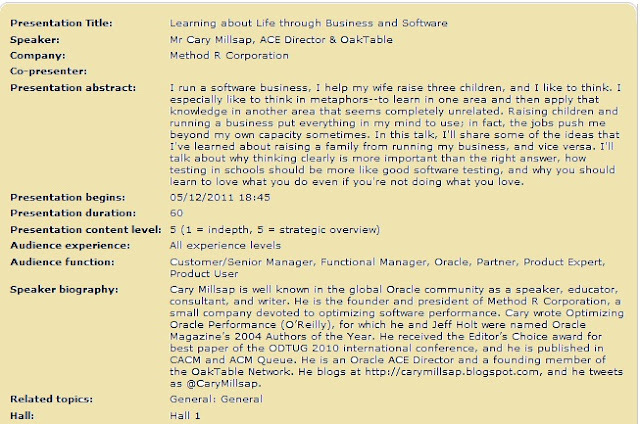 Many know Cary as a fantastic technical speaker but we invited him to UKOUG as also a motivational speaker. Cary mentioned to a group of friends in April he would like to do a talk 'beyond' IT, and I thought we and more importantly our members would like that too. What I really like about Cary is he is so really good at what he does and shares it. I know lots of people who do that, in fact the ACE Director Program has that as a requisite, so why is Cary so special? Cary makes every point simple common sense. I once blogged about presentation styles, and talked about how even I could understand his technical talks. So after months of planning, the agenda was launched and Cary was to be our keynote speaker with the topic of "Learning about Life through Business and Software". Often I have ideas and get carried away with them and then worry that it won't work out, but then I am a worrier so not really a surprise there, but I NEVER worried about this talk from Cary. (I did however worry about Mogens Nørgaard doing the introduction). Cary was excellent, he shared life stories and how they help in Business, and business and science scenarios that help in Life. The presentation was videoed and I hope it will be available soon, because it was classic Cary. Witty, heartfelt and valuable. When I thanked Cary, I said I would blog about the time Cary helped me personally through one of his technical talks. In the presentation that I mentioned in the referenced blog above, Cary gives many different reasons for performance issues. Whilst listening it reminded me of an incident that had happened to me. Once an applications customer was running a report every day, and each day the output grew. The problem was simple, the job always started from day one, it simply needed the start date parameter to change. I sent the example to Cary, and he blogged about it, not simply giving it as an example but taking the problem to a scientific or rather mathematical equation to explain the size of the problem. When I read the blog, and saw the visualisation of the amount of wasted paper over time, I realised that when I worry (did I tell you I am a worrier? ), that worrying about the past is of no value. That simple visualisation (the equation is wasted on me), makes a big difference to me. The tweets I have seen since his presentation, and having spoken to him personally, I know how much everyone who attended love the talk. Thank you Cary, not just for presenting, but for sharing. Debra, again I want to thank you personally for the opportunity to do it.